Right now, you’re reading the first book in The Elder Empire series. But it’s not the only first book. which takes place at the same time from a different perspective. You can begin with either book, and you will find that they each tell a complete story. Upon finishing Of Sea and Shadow, you will be fully prepared for its sequel, Of Dawn and Darkness. But I wrote these first two books together, and their stories intertwine in a way that I think you’ll enjoy. I invite you, when you’re through with this book, to check out Of Shadow and Sea. Welcome to the Elder Empire. Calder Marten stood on the deck of his ship, sailing into the wall of black clouds and rain. He clamped his hat down, holding it tight against the slashing grip of the storm. Calder gripped the wheel, Reading the Intent bound into the wood. His mind flowed through the bones of the ship, sensing every inch of The Testament as though it were his own body. He sent a simple, silent order to his Vessel. Behind him, the sails furled. They looked more like a bat’s wings than ordinary canvas sheets; The Testament’s sails were nothing more than stretches of membranous green skin that seemed to grow from the mast and yard. When they folded, the ship resembled a Nightwyrm bunching its wings to dive. As the ship began to slow, Calder sent another mental command. After a moment they continued moving, jerking forward a few dozen yards at a stretch, as though an invisible giant tugged them along behind. Calder spared a glance from the upcoming storm wall to catch a look at Andel’s face. Andel Petronus was a Heartlander, dark-skinned, and his white suit and hat stood out against the black wood of the deck. The man, as usual, wore no expression. He pressed his hat down with one hand and clung to the railing with the other. Calder silently persuaded the ship to release its four captives: thunderlights, huge alchemical lanterns with copper spikes that unfolded almost as high as the mast. Thick ropes hauled the devices out of the hold through a hatch on deck, until a glass lantern big enough to hold a man rested on each of the four corners of the ship. The lines tightened themselves, tying each thunderlight to the deck, but Andel had to release the copper spike by hand. As the first drops of rain began to slap the ship, Andel turned a crank on the lantern, slowly raising a copper limb into the sky. An Imperial Navigator could sail the Aion Sea with a light crew thanks to the Captain’s control over the ship, but even Calder couldn’t handle everything. The storm was a dark slice of night in front of them now, flashing with lightning and rolling with wind-tossed waves. As the ship slammed down into a valley between two waves, sending spray rolling over the deck, Calder looked to his gunner. Dalton Foster straddled one of the cannons, a hammer in one hand and an alchemist’s spray-bottle in the other. He was leaning out over the railing, his head practically stuck inside the cannon’s mouth. “How’s it coming with those cannons, Foster?” Calder shouted. Foster pulled his head out and turned. His wild hair and beard were soaked through until he looked like a cat that had escaped the bath. He tore one pair of spectacles off, letting them dangle from a cord around his neck, and lifted a second pair to his eyes. Calder squinted up through the rain, scanning the ceiling of dark clouds and jagged light. The Kameira they hunted wasn’t particularly dangerous on its own, but it only flew during lightning-storms. They’d been tracking this one for weeks, and if it got away this time, he might decide to mutiny against himself. Those thunderlights had cost him a hundred goldmarks apiece. Andel finally finished setting the lights, their copper poles stabbing into the storm. Normally they would be risking their mast in a storm like this, but those copper poles were invested to attract lightning. Calder had Read them himself, checking and strengthening their Intent. He only hoped they would work soon, so they didn’t spend any more time in this weather than necessary. Even as the thought occurred to him, a spear of lightning stabbed one of the copper spikes. There came a blinding flash from the starboard thunderlight, and then the liquid in the glass container ignited, glowing with the bright yellow of a cheery summer noon. In essence, thunderlights worked the same as quicklamps: they were glass containers of alchemical formula that produced bright, steady light. But unlike quicklamps, which glowed for a few years and had to be replaced, these thunderlights would work as long as they had lightning to recharge them. They were essential equipment for any Navigator that meant to hunt Stormwings, but Calder was missing something even more critical. Namely, his prey. Normally a Stormwing would show itself on the storm wall, drifting over the tops of the choppy waves, but The Testament was still charging through air thick with slashing rain. All with no sight of the Kameira. Calder was about to call for more drastic measures, but then a song drifted over the detonations of thunder and the crash of waves against the hull. It sounded something like a pod of whales singing in chorus, somehow keeping harmony with the percussion of the storm. “Port side, Andel!” Calder shouted as the Stormwing blasted through a wave. He caught sight of it in flight. The Kameira soared over their ship, a line of pure white lightning with wings of shadow stretching off to the sides. It sang in triumph and exultation as it passed over, its volume piercing even through the storm. The wheel fought him as he forced the ship to starboard, lining up with the Stormwing as it vanished behind a wave. A bright detonation marked the creature’s passage, sending up a towering spray. The Stormwing passed in front, and by the creature’s own luminescence, Calder caught a better look. It resembled nothing so much as a manta ray the size of their ship, with a bright rippling luminescence rolling up the tip of its tail and all the way through its spine. It glided on the wind, lashing the peak of a wave with its tail. A bright flash of light exploded from the point of contact, sending up another plume of water. Calder leaned forward, trying to angle his three-cornered hat so that it kept more water out of his eyes. It didn’t help. A second bolt of lightning lit up the thunderlight on the bow, giving them a better glimpse of the Stormwing as it vanished behind another wave. Foster shouted something that was swallowed up by the thunder, jamming a red ball into the cannon. 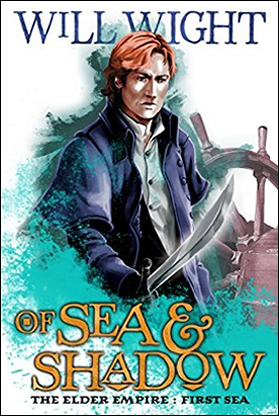 He fumbled around on the end of the cannon as Calder tried to keep the ship as steady as possible, working as much through Reading and his Intent as through any manipulation of the wheel. Finally, a flare of light came from the back of the cannon. The gunner yelled in triumph, hauling his weapon around to point at the storm-chopped horizon. At that moment the Stormwing blasted up from the waves, exposing its belly to the ship, the core of its body rippling with luminescence. It howled a song of triumph. Calder forced his Intent down into the wood. Hold steady. But there was nothing the ship could do against the forces of nature. The Testament began to slip down the other side of a wave. When the cannon fired, its shot tore a strip of skin from the edge of the Kameira’s wing instead of taking the creature in the head. Redshot, a special ammunition used by Kameira hunters, was designed by the Alchemist’s Guild to prevent the powerful creatures from striking back when injured or dying. Simple tranquilizers had been used since time immemorial, but Stormwings were among those Kameira breeds that managed to escape as soon as they felt the pain of the shot. They would simply dive beneath the waves to flee from the pain. With that in mind, a round of redshot was actually a hollow ball containing an alchemical paralytic, tranquilizer, and hallucinogen. The compound was designed to work in concert, confusing and subduing the Stormwing before putting it to sleep. In its confusion, the creature would settle down and float on the surface of the waves to get its bearings. The paralytic meant it couldn’t get far, and as it rested, the tranquilizer would have its time to set in. Calder and his crew would catch the Kameira in their invested steel nets, hauling it back to port to sell fresh. But if the shot wasn’t a direct hit, the whole plan died a fiery death. Now they had a confused, pain-enraged, hallucinating monster striking at them with a tail that caused explosions. And they had to fight it in the middle of a storm. If they made it back to port, drinks were on Foster. The Stormwing screamed, lashing its tail at the ship. The deck exploded in a blinding flash of light, sending splinters, torn rope, and one of the spare cannons hurtling into the storm. Calder felt the broken wood like a physical pain, and through the smoking hole he could see a slice of his hold. He couldn’t help worrying about his wife—she was supposed to be in a different part of the ship, but what if fate was unkind, and she had found herself impaled on a piece of debris? Then again, he was relieved that the Stormwing’s strike hadn’t shattered any of the thunderlights. They had enough to worry about without adding an alchemically fueled fire on top of everything else. Foster clung to the back of his cannon, trying to swing it around for a clear shot as the Stormwing banked around for another pass, screaming as it thrashed its deadly tail in the air. Andel hurried over to the hole in the deck, kneeling and gazing into the hold as though he could fix it in the middle of the storm. “Look what it’s doing to my ship!” Andel shouted. As he watched the Stormwing come back around, Calder realized that he was wasting his time. If they kept at it, they would be flopping around until they got in a lucky shot or the Kameira tore them apart. He abandoned the wheel, hopping down to stand beside Andel. He unbuttoned his sleeve, rolling it up to the elbow. It was about time for extreme measures. Then he pressed his palm to the deck and Read the ship. Visions flashed through his mind--Calder nails one plank to another, begging them to stick; Calder’s mother places her own hands on the wood, persuading them to repel water. He called on the bond between him and The Testament...and the bond between the ship and something far older. A six-fingered hand rose up from the ocean. The hand—webbed, dark blue, and big enough to rip the belly out of the ship—lifted out of the waves like a sunken tower cresting the surface. Dull, algae-spotted metal encircled the wrist: a manacle made of enough iron to re-cast every cannon onboard. Links of chain, each thicker than an anchor, trailed from the creature’s arm to vanish in the dark water beneath The Testament. Reaching up from the storm-tossed surface, the hand closed in a giant fist around the Stormwing’s tail, jerking the Kameira to a halt in the air. The Stormwing screamed, thrashing and beating its wings, even turning in on itself to sink its fangs into the scaled hand. From the shadows beneath The Testament, a cloud of bubbles rose. A hiss of pain sliced through the storm, and the giant arm flexed. It whipped the Stormwing against the water with a crack that deafened the thunder itself. Water rose in a rolling wave away from the impact, a wall of the ocean rising for them. “Brace yourselves!” Calder shouted, and the Quartermaster echoed him. Calder dove for the lines, wrapping himself in fistfuls of coarse rope. When he saw Foster still scrambling to control the loose cannon, he sent a simple mental signal to the ship. Ropes snaked over to Foster, grabbing him by the wrists and ankles and holding him fast. “Light and life protect us,” he muttered to himself, as the wave loomed over them. A weight settled onto his right shoulder as if a cat had suddenly landed there. Something tickled his cheek, and a deep baritone echoed him. “PROTECT US,” it chuckled. Calder turned to glare at the creature perched on his shoulder. It was a squat little monster with a dark green, leathery hide and stubby little bat wings. Its eyes were solid black orbs, its mouth hidden behind a mass of squirming tentacles. Then the icy water of the Aion Sea crashed down on them both. Darkness and cold rushed over Calder, trying to tear his eyes open, drowning his ears in a rush of sound. The water clawed at his body, trying to pull him out and away. His wrists burned where the ropes cut into him, but he didn’t dare loosen his grip. Finally, the wave subsided. Before the water had completely washed over the ship, Calder was untangling himself from the lines, hurrying back to the wheel. The Stormwing was still alive, but it wouldn’t be for long. Each of its wings was caught in the grip of a giant hand, and it struggled uselessly to escape. As the Kameira writhed, a true monster rose from beneath The Testament. Both of its arms were bound in shackles that terminated beneath Calder’s ship, but the rest of its body was unbound. It stood like a man, with a row of ridges running down its spine like sails. Its head belonged to a predatory fish, though it bore three black eyes on either side of its face. It drew the Stormwing closer as though to get a better look at its meal. The Kameira still struggled, but the towering monster’s grip was unbreakable. The blue lips parted, revealing a mouth full of shark’s teeth. It hissed, a sound sharper than a knife’s blade, and gills flapped on either side of its neck. Then the Lyathatan, the Elderspawn bound to the bottom of The Testament, tore its prey apart. One wing came off in each hand, spattering the ship’s deck with droplets of luminescent blood. Calder sent his Intent through the ship, running down the invested chains, to the Lyathatan itself. The Elderspawn was old beyond imagining, but it did tend to listen to its captor. Most of the time. Into his Reading, Calder poured his need for the Stormwing, his desperation to bring back something to sell, and his determination to extract the Kameira’s precious fluid. Usually that worked, though sometimes he had to throw in a bribe. He was cut off when the severed tail and spine of the Stormwing landed on the deck, leaking glowing yellow-white fluid. It was big enough that it crossed The Testament from stem to stern, and bright enough to drown out the illumination of the thunderlights. Calder heaved a sigh and let his whole weight rest against the wheel. Calder ignored it. The Bellowing Horror liked to imitate the most disturbing words it heard, but the creature was entirely harmless. He’d begun to treat the thing like a parrot. Ship captains were supposed to have parrots. It didn’t look like they’d get the full payoff they’d hoped for, but they could probably retain sixty or seventy percent of the Stormwing’s luminescent liquid. Two-thirds of a fortune was still a fortune; the Alchemist’s Guild would pay in hundreds of goldmarks for vials of this fluid. He grinned, settling his hat back on his head, and bowed in the Lyathatan’s direction. The giant was slowly settling beneath the waves, hissing as it disappeared under the water. Calder wasn’t sure he could count the Lyathatan as an ally, exactly, but certainly as an asset. It had agreed to serve him for a short time, but ‘a short time’ to the ancient Elderspawn could extend into the lives of Calder’s grandchildren. He turned the wheel, sending his Intent down, and the Lyathatan obediently dragged the ship along. Away from the flashes of lightning. After weeks of chasing this Kameira, they could finally leave storms behind them, and Calder had never before looked so forward to sunshine. Petal slid out behind Urzaia without a word, her frizzy hair hiding her face. She sank onto the deck beside the severed Stormwing spine, crooning as she milked glowing liquid into her bucket. Calder didn’t bother saying anything. When the ship’s alchemist was lost in her own world, nothing so mundane as human speech would get her attention. The next person onto the deck was a surprise: his wife, Jyrine Tessella Marten. Jerri wore a bright green raincoat that matched her emerald earrings. Bracelets flashed on her wrists as she hurriedly pulled her hair back, tucking it under her waterproof hood. She wore a wide, eager smile that instantly worried him. It had taken him days of pleading to get her to stay below during the confrontation with the Kameira. There was nothing she could do to help, and the more people they had on deck, the greater the risk. She had finally agreed, but she wasn’t happy about it. If she thought there was something in the hold more interesting than two giant monsters fighting, he needed to see it. She rushed up to him, pecking him on the cheek and wrapping him in tanned arms. Alarm bells sounded in his head. “You would not believe what I found down in the hold!” Her eyes sparkled as though she had heard wonderful news. That was entirely too intriguing to pass up, so he let her guide him down into the belly of the ship. The hold had been packed with barrels, crates, and packets of gear, though most of the space was unoccupied. They had planned to return with a new load of cargo, after all. Now, raindrops and thin rivers of luminescence flowed in from the fractured deck above, through the hole that the Stormwing had blasted. Some of the crates had cracked open, leaking salt or wine, and a loose barrel rolled around on the wood. Calder stopped the wild barrel with one foot, looking around for anything unusual. Jyrine picked up a quicklamp, shook it, and raised it to one side. In the splash of yellow light, Calder saw a message burned into the inside of the hull, as though someone had scorched a letter onto his ship. Thin wisps of smoke still rose from the charred wood. He did, his own excitement growing by the word. Hope this mysterious message finds you well! I just learned how to do this, and it’s going to blow the pants off certain people back in the Capital. If you see it first, show it to Jyrine. She appreciates a good touch of theater. The Guild has a new client. A pair of Witnesses wants to hire you to take them to a certain island, and withdraw a certain relic. This could be huge, Calder. Not just for you, but for the Empire. And for the Emperor. Whatever else this letter said, the Emperor had been dead for over five years. What did the Witnesses hope to find on the island? A way to bring him back from the dead? With the Emperor, they might even be able to do it. That was a disturbing thought. And by the way, this will be big for you. This was the Chronicler in charge of finance in the Imperial Palace. He wants me to tell you that if you’re successful, you will “sleep under sheets of golden silk in the cabin of your flagship. At the head of your brand-new fleet.” His words. So I suggest you get your leaky tub and your flea-bitten crew back to port before he comes to his senses and hires somebody else.